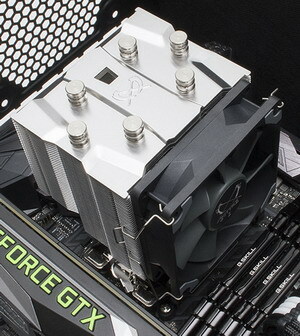 Japanese cooling expert Scythe presents the fifth generation of its popular all-round Katana CPU cooler. This new version comes with a revamped asymmetric heatsink design and total height of only 135 mm, offering unrestricted compatibility to mainboards and memory modules. The second generation of the Easy Clip Mounting System (E.C.M.S) assures a fast and easy installation process. Another key innovation of the Katana 5 is the newly developed Kaze Flex 92 PWM fan. It combines the high-quality Sealed Precision Fluid Dynamic Bearing with anti-vibration rubber spacers for silent operation and long lifespan. The Katana series ever since the initial release aimed for great versatility. Scythe underlines this further with the release of the Katana 5, which offers optimum performance at compact dimensions and an advanced multi-socket mounting system at a competitive price. The fifth generation offers even more added value by incorporating a band new asymmetric heatsink design for unrestricted compatibility to both mainboard components and memory modules. In addition to that, all three high-quality copper heatpipes as well as the massive copper-baseplate have been nickel-plated for the fifth generation. This upgrade protects the copper from corrosion and lets Katana 5 look more unified. Being able to be easily installed on all major CPU sockets has been another key advantage of the Katana series. Katana 5 comes with already pre-installed Intel™ Push-Pin mounting clips, ready to be mounted on Intel™ sockets out of the box. Installation on AMD™ mainboards is equally simple, as users have to only replace the two brackets and the Katana 5 is ready to be fitted on the retention module. The improved second generation Easy Clip Mounting System (E.C.M.S) on Katana 5 assures a convenient and secure mounting process while supporting Intel™ sockets LGA775, LGA115X and LGA1366 as well as AMD™ sockets AM2, AM2+, AM3, AM3+, FM1, FM2, FM2+ and AM4. The package includes the Katana 5 with the mounting clips as well as thermal grease and one Kaze Flex 92 mm PWM fan with the mounting fan clips. The new Scythe Katana 5 with the Model-No. SCKTN-5000 is available as of today with the MSRP at 23,50€ (VAT/Taxes not included).